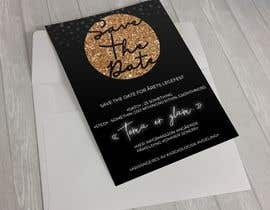 I need a save the date invitation for an upcoming party. The theme of the party will be glamour. I of course want the invite to reflect the theme of the party. In addition I would like to have to heart graphics. The reason for the hearts will be explained below. Header: «Save the date for årets legefest» (Save the date for this year's party). - «Sted» (Location): Somethin Gso Mthingso Mthin, Gsomthngso. - «Mer informasjon angående påmelding kommer senere» (More info will come later). - «Arrangeres av kardiologisk avdeling» (Arranged by the cardiologist department). I have added some examples of invites in the style I would like. Please update the invitation size.